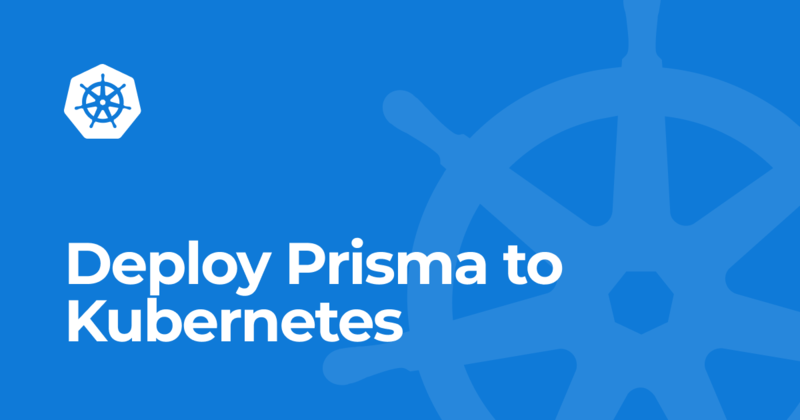 In this tutorial, you will learn how to deploy a Prisma server on Kubernetes. Kubernetes is a container orchestrator, that helps with deploying and scaling of your containerized applications. The setup in this tutorial assumes that you have a running Kubernetes cluster in place. There are several providers out there that gives you the possibility to establish and maintain a production grade cluster. This tutorial aims to be provider agnostic, because Kubernetes is actually the abstraction layer. The only part which differs slightly is the mechanism for creating persistent volumes. For demonstration purposes, we use the Kubernetes Engine on the Google Cloud Platform in this tutorial. All Kubernetes definition files are also bundled in this repository. You can go ahead now and create a new directory on your local machine – call it kubernetes-demo. This will be the reference directory for our journey. Prisma supports a good range of different database systems. Although we use MySQL for this tutorial, the steps can be easily adopted for a different database system, like PostgreSQL. You should see a new disk in the Disk Overview on the Google Cloud Platform after a couple of seconds. Now where we have our disk for the database, it is time to create the actual deployment definition of our MySQL instance. A short reminder: Kubernetes comes with the primitives of Pods and ReplicationControllers. A Pod is like a "virtual machine" in which a containerized application runs. It gets an own internal IP address and (if configured) disks attached to it. The ReplicationController is responsible for scheduling your Pod on cluster nodes and ensuring that they are running and scaled as configured. In older releases of Kubernetes it was necessary to configure those separately. In recent versions, there is a new definition resource, called Deployment. In such a configuration you define what kind of container image you want to use, how much replicas should be run and, in our case, which disk should be mounted. When applied, this definition schedules one Pod (replicas: 1), with a running container based on the image mysql:5.7, configures the environment (sets the password of the root user to prisma) and mounts the disk database-disk to the path /var/lib/mysql. Before diving into this section, here's a short recap. Our MySQL database pod is now running and available within the cluster internally. Remember, Kubernetes assigns a local IP address to the Pod so that another application could access the database. Now, imagine a scenario in which your database crashes. The cluster management system will take care of that situation and schedules the Pod again. In this case, Kubernetes will assign a different IP address which results in crashes of your applications that are communicating with the database. To avoid such a situation, the cluster manager provides an internal DNS resolution mechanism. You have to use a different primitive, called Service, to benefit from this. A service is an internal load balancer that is reachable via the service name. Its task is to forward the traffic to your Pod(s) and make it reachable across the cluster by its name. ports: Here you map the service port to the actual container port. In this case the mapping is 3306 to 3306.
selector: Kind of a query. The load balancer identifies Pods by selecting the ones with the specified labels. Okay, fair enough, the database is deployed. Next up: Deploying the actual Prisma server which is responsible for serving as an endpoint for the Prisma CLI. This application communicates with the already deployed database service and uses it as the storage backend. Therefore, the Prisma server is a stateless application because it doesn't need any additional disk storage. This configuration looks similar to the deployment configuration of the MySQL database. We tell Kubernetes that it should schedule one replica of the server and define the environment variable by using the previously deployed ConfigMap. Okay, done! The Prisma server is now reachable within the Kubernetes cluster via its name prisma. That's all. Prisma is running on Kubernetes! The last step is to configure your local Prisma CLI so that you can communicate with the instance on the Kubernetes Cluster. The upcoming last step is also necessary if you want to integrate prisma deploy into your CI/CD process. The Prisma server is running on the Kubernetes cluster and has an internal load balancer. This is a sane security default, because you won't expose the Prisma server to the public directly. Instead, you would develop a GraphQL API and deploy it to the Kubernetes cluster as well. You may ask: "Okay, but how do I execute prisma deploy in order to populate my data model when I'm not able to communicate with the Prisma server directly?". That is indeed a very good question! kubectl comes with a mechanism that allows forwarding a local port to an application that lives on the Kubernetes cluster. The Prisma server is now reachable via http://localhost:4467. This is the actual endpoint you have to specify in your prisma.yml. So when your service should have the name myservice and you want to deploy to stage production, your endpoint URL would look like: http://localhost:4467/myservice/production. With this in place, you can deploy the Prisma service via the Prisma CLI (prisma deploy) as long as your port forwarding to the cluster is active. Okay, you made it! Congratulations, you have successfully deployed a Prisma server to a production Kubernetes cluster environment.